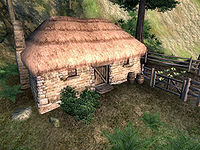 Drakelowe is a farmhouse south of Cheydinhal (quest-related). This settlement, consisting of a single house, is located on the eastern shore of the Reed River, just north of the small fork on the river's east side. It is directly under the "T" in "The Reed River". The only inhabitant, Melisande, is rumored to be one of the last witches of Glenmoril and to know the recipe for a cure to vampirism. Drakelowe also has a vegetable patch with several ingredients that can be freely harvested (see note for details). 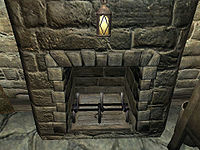 The south fireplace inside the house is actually a secret trapdoor, positioning your cursor near the front side of the fireplace will let you open it. Entering the basement counts as trespassing, so it is recommended to sneak in while Melisande is sleeping. 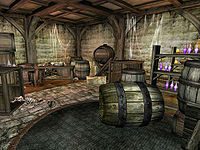 In the basement you will find a large collection of bones, novice alchemy equipment, nine soul gems of various sizes (including a grand soul gem needed for the related quest), a large selection of potions and poisons (31 in all) and some generic clutter. A road leads south from the house across a bridge and down several flights of steps to a dock by the Reed River. A chest with minor loot is in the water underneath the dock. The farm contains 10 strawberry bushes, 5 tobacco plants, 14 blackberry bushes and 8 lettuce plants. Drakelowe appears in ESO as Drakelowe Keep. Drakelowe is marked as a private area. Therefore, do not wait too long to begin the dialogue with Melisande or she will change to combat mode and attack you. Trespassing does not affect the quest dialogues with her. 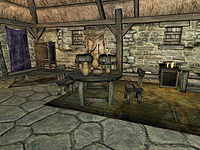 This bug is fixed by version 2.1.0 of the Unofficial Oblivion Patch. This page was last modified on 23 August 2018, at 00:19.